So since it’s January and a lot of us are struggling to keep our New Year’s resolutions up – or just to get ready for bathing suit season – I’ve been trying to include some healthier items here on VV. My main temptation is snacking – usually something salty and crunchy with a nice creamy or cheesy dip on the side. So here’s what I’ve got to satisfy that craving without quite so much of the guilty aftertaste. I absolutely love guacamole. It tastes so sinfully rich, but it’s actually quite nutritious. Avocados have a good amount of fat in them, but most of the fat in an avocado is monounsaturated, which is the “good” kind of fat since it has been shown to lower bad cholesterol levels and raise good cholesterol levels. To boot, they are high in potassium, B vitamins, vitamin E, vitamin K, and even fiber. 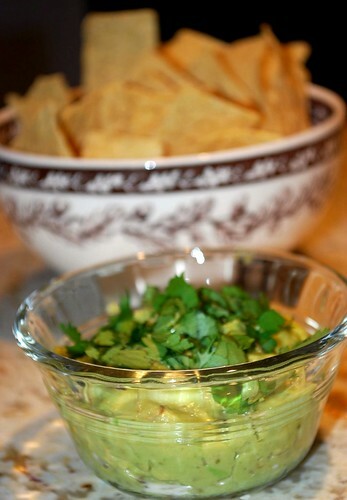 Moreover, guacamole tastes so much better when you make it fresh than with that store-bought stuff. It’s easy to put together, too! Instead of going for store-bought corn chips with cheese- or sour cream-based dips, try out some guacamole with baked tortilla chips to keep those resolutions!!! 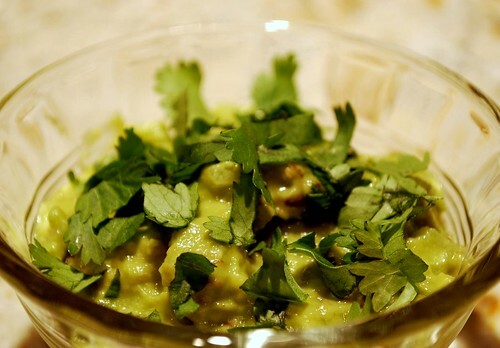 Using a fork, mash up the avocados in a medium bowl. Add onion, lime juice, garlic, and cumin – stir to combine. Add salt and pepper until desired seasoning is reached. Spoon into a serving dish and sprinkle cilantro on top! Note: you may also wish to add minced jalapeno, cumin, fajita seasoning, red onion, green onion, corn, diced tomato, sour cream, or shredded cheese. 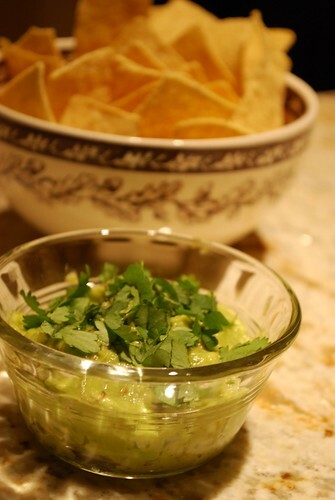 We like to keep the guac simple and non-spicy in my family! Preheat oven to 375 degrees. Stack your tortillas on top of one another. With a serrated knife, slice through all the tortillas to make wedge-shapes, like you’re slicing a pizza. Arrange tortilla wedges in a single layer on a greased cookie sheet. In a small bowl, mix together olive oil and lime juice. Using a pastry brush, brush this mixture over the tortillas. Sprinkle with fajita seasoning. Bake for 10-12 minutes, or until desired crispiness is reached. Serve warm with guacamole or salsa. This recipe is also good with Cajun seasoning, Greek seasoning, or any other spice blend that you like!